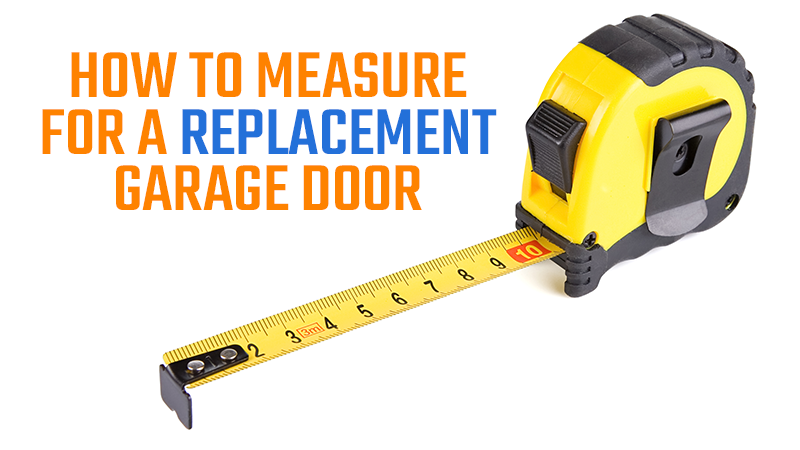 If you’re looking to replace your garage door, you’ll have to measure for the new one. While measuring is easy enough, it helps to understand the importance of each dimension. The new door will require a certain amount of space around it for the rails, torsion spring or extension springs and the automatic opener. A tight space could mean a search for customized parts to make the door and mechanisms fit. Too little space may mean re-thinking the entire project. Here is a guide to measuring for your new garage door installation. Measure from the floor or cement lip on the floor, where the door will rest when closed, up to the top of the opening, inside the jamb. Make sure you mark down your measurements and log them to the closest fraction of an inch. Most rough openings for standard residential garage doors are about seven feet. This is the inside opening from side to side. Like the height, measure the inside of the jamb. Together with the height, this is the size of the door itself, made to fit within the jamb. Now take the measurements for the side walls of the garage. Start at each of the side jambs and measure out to the side walls or the nearest obstacles such as pipes, ductwork, hanging tools, shelving or an entry door. The minimum space for your rails is going to be about three and a half to four inches. Make sure the wood of the jamb is in sturdy shape. Same goes for the header jamb. You’ll need to measure the distance from the top of the opening to the ceiling or floor joists if the ceiling isn’t finished. This is where the spring is going to be fastened. At a minimum, you’ll need 10.5 inches over the door for extension springs and 13 inches for a torsion spring. Depending on the type of door you plan to install, you may need up to 18 inches of headroom. Wood doors tend to take up more room above the header jamb. Also, account for another 3 inches in header room for the electric opener. Since your open overhead door will be resting along the ceiling, you must have enough room there to accommodate the height of the door, the rails and the opener. Generally, this will be about 18 inches more than the height of the door itself. Measure the ceiling from the front wall towards the back. If the garage or space is relatively short, you may not have enough room, but that’s pretty rare. The more complicated your garage space, the more tricky the garage door installation may be. If you have drop down stairs or tight clearances, you might need customized hardware. Don’t forget, the floor where the door will rest must be even. 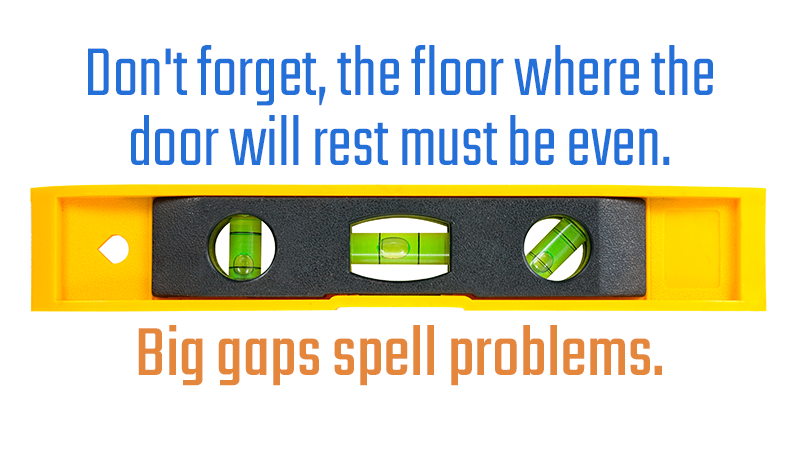 Big gaps spell problems. We highly recommend professional help with this project. ACS Overhead Doors is here for you. Our trained and experienced staff know exactly what to look for, how to measure for the perfect fit and can give advice for those unusual situations as they arise. We love the challenge of difficult jobs, so give us a call today or schedule an appointment online right here. We’ll make your project easy for you!